The characteristics that are desired by the modern manager can be developed and reinforced through mind training. When I was a young certified public accountant, more years ago than I care to count, my first job was auditing a rapidly growing energy firm in Houston, Texas. It was a successful firm run by an aggressive entrepreneur -- I'll call him "Howard" -- who paid his employees more than they could make anywhere else. But we all hated coming to work on their account. Howard yelled at his employees, insisted they work crazy hours, and demanded they be available 24/7. Crazily stressed and absolutely miserable, the employees felt trapped in their jobs by the high salaries. It all blew up when we discovered, at the end of the auditing assignment, that Howard had been dealing with the mob and bribing a foreign official -- as proven by FBI wiretap recordings. Howard was an example of what I call the Driven Leader. The Driven Leader is highly task focused and transactional, hierarchical and controlling, self-centered and demanding. He may offer high rewards for short-term performance while being intolerant of employees' personal needs and mocking ideas about the importance of morale, corporate culture, and shared values. The Driven Leader often cuts ethical corners, making decisions based less on "what's right" than on "what's legal," or even "what I can get away with." As a result, the career of the Driven Leader often ends when unpleasant surprises surface -- which can sometimes spell doom for the entire organization. After my encounter with Howard, I swore I'd never again be part of such a toxic work environment. Unfortunately, I didn't manage to keep that promise to myself. Over the years, I've worked with and supported other Driven Leaders -- though none quite as extreme as Howard. Many had track records of delivering good business results for their organizations, but their teams seemed stressed out, tortured, and emotionally damaged. Over the long run, these individuals emotionally damaged both the people who worked for them and economically damaged the companies they served. I guess I hoped I could help to change them, and I admit being motivated by the money our investment firm made on these investments. But I never did manage to significantly alter the behavior of any of those Driven Leaders and I've come to regret compromising my principles by supporting them. Fortunately, I've also had the opportunity to work with many leaders of a different kind -- a style I refer to as the Mindful Leader. The Mindful Leader is the open, inclusive manager who is comfortable in a flat management structure where every member of the team is respected and listened to. Unlike the Driven Leader, who is often obsessed with work and remote from family and friends, the Mindful Leader has passionate non-work interests and rich, intimate connections with people away from the office. Working for a Mindful Leader is usually creative, interesting, and just plain fun -- and you can usually be certain that you won't be asked, or forced, to do anything that seriously violates your most deeply held ethical values. And I've seen over and over that Mindful Leaders run companies that are equally -- and often even more -- productive, high-impact and profitable as those led by a Driven Leader. They tend to have lower employee turnover rates and are more likely to have open, integrated, teams. Clearly a place I would rather work! Lots of other students of business are noticing and writing about these leadership tendencies as well. For example, check out the article "Understanding New Power" by Jeremy Heimans and Henry Timms in the December 2014 issue of Harvard Business Review. What I call Driven Leadership and Mindful Leadership, Heimans and Timms call Old Power and New Power. Others have written about servant leadership, adaptive leadership, collaborative leadership, systems leadership, and authentic leadership. There are differences among these ideas, of course, but I think that fundamentally they all describe the same kind of leadership I call Mindful Leadership. They are variations on a kind of leadership that almost all of us appreciate and want to see spread through more organizations around the world. For thirty years, I was a private equity/venture capital investor on Wall Street, ending up as a vice chairman at JPMorgan. Since retirement ten years ago, I've been very active in the nonprofit world, participating in the global health, systems change, and social entrepreneurship movements. I've met both Driven Leaders and Mindful Leaders in every type of organization, from entrepreneurial startups and giant corporations to nonprofit organizations and international agencies. And I'm happy to say that, over the years, I've seen a definite change in the face of leadership. More and more organizations are turning away from the Driven Leader model and giving power to Mindful Leaders dedicated to building humane and sustainable work environments in which every team member can thrive. But though the trend is in the right direction, it's not moving fast enough. We still see the signs of Driven Leadership in too many places. We see executives who drive their team members so hard that they create toxic workplaces that literally kill people -- including the Driven Leaders themselves. (I'm thinking about a manager I know who committed suicide before he was 60 years old, of another who died of a heart attack in his early sixties.) And we see once-great organizations falling prey to unethical behavior -- Volkswagen installing software in its cars to cheat on emissions tests, General Motors lying about the safety of its cars, officials of the international soccer federation accepting millions of dollars in bribes. Why are organizational environments like these still allowed to exist? Driven Leadership, with all the problems it produces, is simply unacceptable in this second decade of the twenty-first century. What's more, it's completely unnecessary. We now have the tools we need for each of us to become more mindful -- and more effective -- leaders. For forty years, I have been exploring, studying, and using the tools that help individuals become Mindful Leaders. I practice yoga and meditate regularly. I go on retreats a couple of times a year. I spent a year studying Tai Chi and I read widely about the science and art of personal development. I am constantly experimenting with new ways of delving deeper into self-understanding and I seek out opportunities to share my experiences and insights with a community of like-minded friends. Nowadays, it's a community that is growing rapidly. Not so long ago, when colleagues in the business world heard about my mindfulness practices, they would stare at me as if I'd lost my marbles. Now, they're more apt to say, "Tell me more!" And I'm happy to share what I know. I believe I am a more balanced, effective, and energized leader because of my mindfulness training. I know I've never felt more alive or more excited about life. My personal experience is supported by a growing body of scientific evidence. Research on mindfulness has found that brain activity and structure changes after regular practice, leading to enhanced emotional regulation, better memory, and improved perspective-taking. Mindfulness techniques have also been shown to enhance cognitive functions, including focused attention, working memory, and unfocused sustained attention. People who practice mindfulness function more effectively and generally feel better. If Mindful Leadership is a new concept for you, don't fall into the trap of assuming it is an esoteric practice with little relevance to the real world of business. 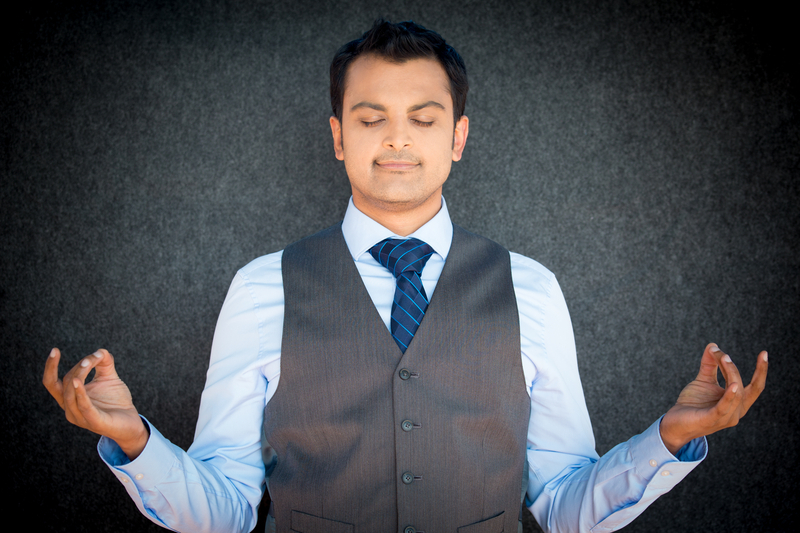 Mindful Leaders don't just sit in their offices, staring at the wall, chanting "Ommm." Instead, they strive to put wisdom, compassion, and action into practice, balancing head, heart, and hands. All are equally essential for anyone who hopes to be a powerful, effective leader. The Mindful Leader seeks to live and work at the center of a golden triangle where these traits are fully realized. A leader who has difficulty controlling distractions and maintaining focus can enhance the clarity of her thinking by practicing concentration, using, for example, a single visual object or spoken mantra. A leader who needs to get better at managing stress, anger, and fear might try practices that focus on breathing or body scan. A leader who wants to enhance his sense of empathy and become a more effective team player and collaborator can work on practices that emphasize loving kindness and compassion training. A leader whose goal is a better-managed ego, a stronger moral center, and enhanced self-awareness might try self inquiry practices. A leader seeking better overall health might think about yoga or Tai Chi. And a leader who wants to be a better listener and enjoy enhanced creativity might try open awareness and walking meditation. Wherever you are in your personal leadership journey, you'll want to experiment and explore to develop your own customized blend of contemplative techniques. Not every tool is right for every individual -- but almost every individual can find one, two, or several such tools to help become a more effective leader. Find mentors -- leaders you respect who share your interest in mindfulness and whom you can learn from (as well as teach). Find a community -- a small group of fellow travelers with whom you can have a "walls down" relationship, sharing, comparing, and learning. They will help you reinforce positive practices and will uncover areas you need to work on that you cannot see on your own. Avoid working for a leader who isn't mindful -- a difficult challenge in today's competitive, demanding world, but an important one for your personal development. Spread the word! If you find that mindfulness practice is enhancing your life and your leadership abilities, let others know about it and help them get started on the same path. Support efforts to make mindfulness part of the leadership curriculum in business schools and corporate training programs. Not every organization has yet absorbed the importance of mindfulness as a crucial component of twenty-first century leadership. At a 2015 leadership conference led by the Mind Life Institute, many of the 100+ managers from for-profit and nonprofit organizations in attendance reported being fearful about promoting mindfulness within their organizations. They didn't think senior management would support them and they worried their careers would be hurt. As a society, we are not yet at the tipping point for mindfulness. Leaders want to know that these tools will create positive organizational and behavior change. More research needs to be done. Yet a lot of progress has been made. Mindful Leadership is growing in leaps and bounds. Aetna has provided thousands of employees with mindfulness training, which has reduced health care costs and increased productivity -- check out the NYTimes article -- and their CEO speaks passionately about how his personal mindfulness practice has improved his life. Google pioneered mindfulness training for employees through their wildly popular "Search Inside Yourself" program. Reboot.io includes mindfulness as a key pillar in their mentoring program for young entrepreneurs and CEOs. The University of Virginia hosts the Contemplative Sciences Center, where I chair the advisory board, and is working to pioneer a replicable "contemplative university" model to mainstream a variety of contemplative practices as a core part of a successful academic life. CEOs of global health and development organizations such as the END Fund and Heifer International have hosted mindfulness speakers at their organizations and are actively speaking about how their personal meditation, yoga, and mindfulness practices enhance their work to end suffering around the world. Check out the article some of these leaders wrote together in Tricycle Magazine. Bill George, former CEO of Medtronic, has launched a popular Authentic Leadership course at the Harvard Business School. UVA's Darden School and Drucker have teamed up to teach a Mindful Leadership course for experienced business professionals. And a well-known private equity firm recently spent two days training for their staff with Janice Marturano, founder of the Institute for Mindful Leadership. There are so many examples of the expanding mindful leadership movement, in fact, that New York Times writer David Gelles recently documented these trends in a great new book called Mindful Work. It's only a matter of time before Mindful Leaders equipped with the powerful tools I've described will transform every industry and nonprofit arena around the globe. If you aren't already, isn't it time for you to become part of this movement too?